Children with autism develop differently, communicate differently… It is essential to understand him/her to be able to guide the child effectively. The behaviour problems are generally caused by difficulties in communicating. Establishing an appropriate communication system with the child will help reduce behaviour problems. Our workshops provide practical tools validated by 30 years of experience as communication specialist. It helps parents to be fully involved in their child’s education and guides professionals in the care they provide. ABLE - Julie Tuil organizes both public and onsite workshops. The ABA method helps people communicate efficiently with their environment in order to gain greater independence. The theory is illustrated through videos and put in practice during role plays. 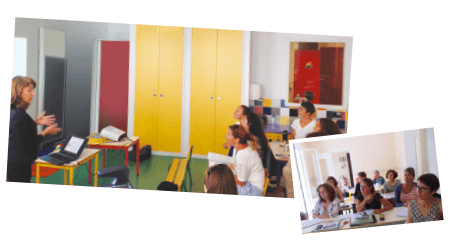 The goal of our workshops is to provide practical tools to apply directly with autistic people or people with communication disabilities, in order to improve their communications skills and guide them towards greater autonomy. Our workshops give you the keys to deal with difficult situations.